A New Mac Tip Every Day: The SMART status! All the newer hard drives include a new technology called SMART status. Depending on the kind of hard drive failure, the SMART status should let you know that a failure is imminent before it happens. It gives you the time of backing up your data. Not all failures show up in the SMART status, but it is still a good idea to keep an eye on it. There is a way to check it in Disk Utility. Disk Utility is located in Applications/Utilities. 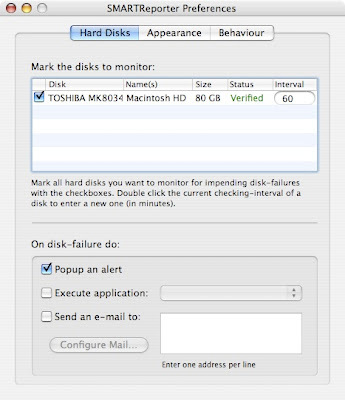 When you select your hard drive in the left section of Disk Utility, the S.M.A.R.T status will appear in the lower right corner. It should be "Verified". The only problem with that is that you don't run Disk Utility every day. I really like a small freeware called SMARTReporter. It runs in the background without any icon in the Dock, or the "Command-Tab" dialog. It adds by default an icon in the menu bar, but you can choose to deactivate it. The icon is green when SMART is Verified and red when it is not. What I like about it is that you really don't need the menu bar icon because you can choose to get an alert if the status switches to an unverified status. The other option instead of an alert is to have the application send you an email. The email is great if you want to install it on a server or somewhere else where you are not always in front of your computer. You can download SMARTReporter here from MacUpdate. Interesting program...but it doesn't recognize my external drives. Thanks for the great tip, by the way what was the link for the website u made, to help window users to move to mac? If someone can help me...i verified my disk and it had to be repaired, but i cant get the repair button to be clickable... what do i have to do?!?! S.M.A.R.T. Status does not seem to support external drives; When I click on my Externals, the status is "Not Supported". I did the permission verification and repair but when i put disk verification it says volume needs repair but the repair button is not clickable...what can i do?! or have to go to an apple store??? Why does SMART Status not support external drives? I don't believe that Mac OS X currently supports SMART status of external drives by firewire or USB. Only drives connected via serial port.